Getting your hands on some good project management software will provide you with a sophisticated tool to assist with the many and varied aspects of managing your project. There is plenty of choice on the market with a range of prices to match. Let’s have a look at the benefits it offers for your self build project and some programs to consider. Project Management Software – What does it do? Project management software takes basic techniques, like those discussed on our PM tools page, and supercharges them to produce sophisticated systems for assisting with scheduling, resource management, communication, cost control, quality control, issue tracking and project administration. Take our trusty Gantt chart for example. Task links according to their inter-dependencies. Finish to start – e.g Ground floor walls must finish before first floor construction can start. Lead and lag times – e.g 5 days after starting the ground floor walls the bricklayers will require a scaffold for access. These tasks would be linked by a start to start with a 5 day lag for the scaffold. Milestones (dates when a particular item must be completed). Resource information – People, materials and equipment requirements. Produce a Gantt chart displaying the project schedule, start and finish dates, task durations and interdependencies. 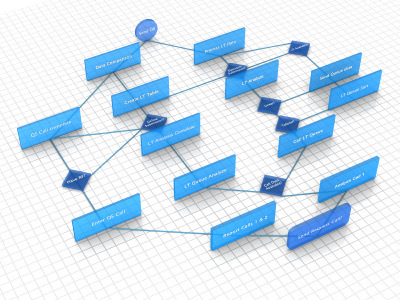 Calculate the critical path of the project – This is the chain of events that must completed on time and in sequence in order to maintain the project schedule in its entirety. Highlight non-critical tasks – Tasks not in the critical path will often have float or slack which is flexibility in their start and finish dates. e.g. The drainage could be laid at the start of the build when the foundations have been pulled or left until the end and done just before the landscaping takes place. Adjust the entire program if any changes are made to a task – e.g. If the foundations take an extra day, you can enter this information and the whole schedule will be adjusted automatically. Alert you to adjustments that compromise the critical path and affect any milestones or completion. Convert the project information into various formats such as Calendar, PERT, Gantt and WBS at the click of a button. Monitor and manage resource requirements. If you just want something to assist with running your self build project then there is really no need to go overboard on complexity or price. Probably the best known program is Microsoft Project 2007 (PC) . It is the market leader and the benchmark by which all others are judged but with the standard version retailing at around £500 it’s probably a bit excessive for a self build project. However, if you have a good sized business that would benefit from some top notch management software then it is worth considering. Luckily, there is some great and affordable project management software available which will do everything you need. You can download a free trial version of each, so why not try before you buy?